My Name is Daniel Sebastian Villela. Im 27 years old. I live in New York City. 4. Do you have any favorite artists or writers? I’m more of a visual person and I like all kinds of styles and am all over the place- just like with comics. So some of my favorite artists are James Jean, Wayne Barlowe, Mike Mignola (of course), Zdzislaw Beksinski, Maurice Zendak, Mary Blair, Arthur Rackham, and Lukasz Banach to name a few. 5. So what got you into tattoos? 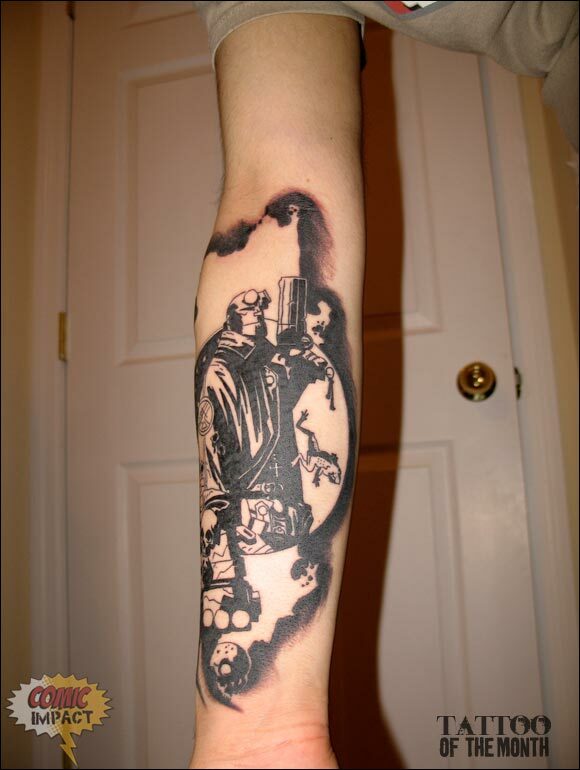 My tattoo is a Mignola Hellboy illustration he created for a limited edition print. I never had a chance to own the print so I grabbed it from “the Art of Hellboy” book. Well I have an obsession with the Hellboy comics and there’s tons of Mignola art that I love. But that specific illustration had all the elements I wanted in my tattoo. It wasn’t just a standing figure. He was framed in a circle with night behind him and light in front of him. I loved all the details in it. The frog by his chest. The stars and the skulls all around him. The tattoo too about 4 and a half hours. I got at Rising Dragon Tattoo in the Chelsea neighborhood of New York City. 10. 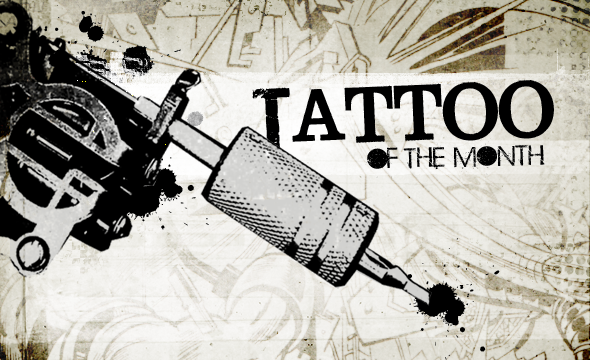 Have you met any of the artists or writer that your tattoo is based on? I have met Mike Mignola several times at book signings and twice at San Diego Comic Con. 12. What is the funniest thing that has happened to you when people see it ? Well my family had a funny reaction to it. My aunt said everyone puts so much deep meaning to ugly tattoos all the time that it was refreshing to see a nice piece done with no deep meaning to it, except for the fact that i loved the art. 13. Are you hoping to get more comic book ink ? Well the arm that it’s currently on is going to be a complete Mike Mignola sleeve. As far as the other arm goes, I want to get something from James Jean’s Fables cover art. I also just recently got a Mignola frog with a floating crown tattoo on the left side of my neck. 14. What do you like to do when you’re not getting tattoos? Such as where do you work and what kind music do you like, and any thing else you want to tell us. ? I love going to the movies. I love to draw. I’m a professional illustrator and 3D artist for a company that develops flash based multiplayer games called iminlikewithyou.com. I am a music fanatic as well. Some of my favorite bands are Sunset Rubdown, The Raveonettes, The Hidden Cameras, CocoRosie, Final Fantasy, and The Fiery Furnaces to name a few. 15. Great do you have a website or a myspace?